Objective The main purpose of this article is to report the systematic data collection pertaining to the consultations of a group of qualified homeopathic physicians. Studies have been performed concerning: (1) the most frequently treated pathologies; (2) the symptoms reported by patients, with a particular focus on “fear” symptoms; and (3) the evaluation of the outcomes of the treatment, including likelihood ratio (LR) for fear symptoms of mostly prescribed remedies. Setting Individualized homeopathic treatment at private homeopathic surgeries in Italy. Participants Adult patients asking for homeopathic therapy for a series of common ailments. Outcome Measures Types of diseases and remedies used and clinical parameters (frequency of acute attacks, and their intensity and duration); the overall outcome of the cure was registered using the Outcome Related to Impact on Daily Living (ORIDL) scale. Results Only 94 patients could be enrolled by eight homeopathic doctors in a 2-year period between 2015 and 2017. Ninety (72 females, 18 males) patients completed the observation period. The most represented pathologies belonged to the group “Anxiety and anxiety disorders” followed by gastrointestinal ailments. The most prescribed remedy was Phosphorus (9 cases), followed by Natrum muriaticum (4 cases) and Ignatia (4 cases). The intensity of the symptoms and the frequency of the attacks decreased during the course of the study. Most patients reported a positive outcome (ORIDL scale). In the “Phosphorus” group, LR values were calculated for fear symptoms: LR+ for fear of dark = 2.25 (95% confidence interval [CI] = 0.56 to 9.02), LR− for fear of crowds = 1.27 (95% CI = 1.13 to 1.42), and LR− for fear of ghosts = 1.12 (95% CI = 1.04 to 1.22). Conclusion The recruited group was smaller than expected, but data from most participants could be collected. Positive clinical outcomes were recorded and LR of a few specific fears contributed to distinguish Phosphorus patients from the remaining population. 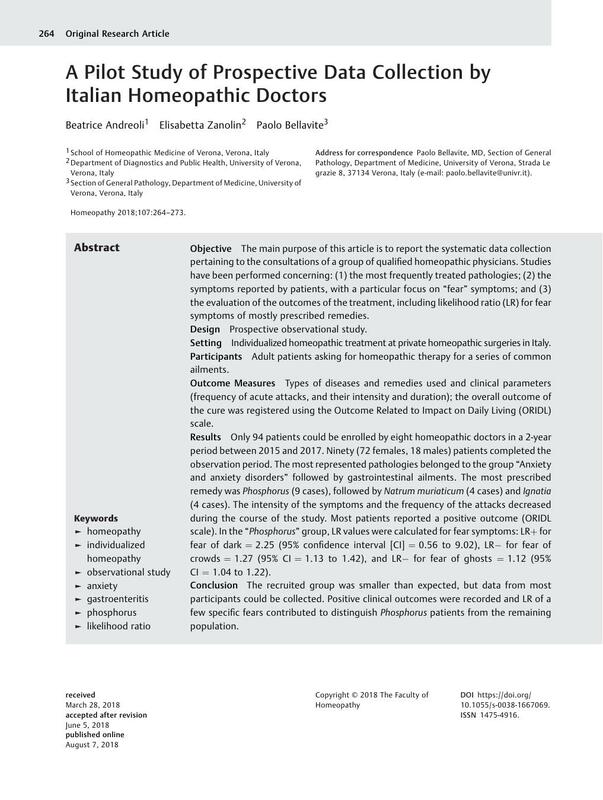 • A group of eight qualified homeopathic physicians prospectively reported clinical data of the most frequently treated pathologies observed in their private surgeries. • During 2 years, only 90 patients completed the study, suggesting that more simple and practical protocols must be set up for large-scale data collection. • The outcomes subjectively reported (intensity and frequency of symptoms) were positive and statistically significant as compared with the baseline. • The determination of LR for some “fear” symptoms detected small differences between patients treated with Phosphorus and remaining population. • The absence of “fear of crowds” was more common in patients treated with Phosphorus than in the remaining population.